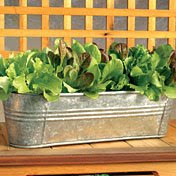 I'd like to get some of these grow tubs to grow lettuce and herbs in them this gardening season. I've planted lettuce in the ground which grew great, but the herbs...well, not so much. Last year the weeds took over to the point that I couldn't tell the difference between most of my herbs and the weeds. So I gave them up. I'm hoping tubs like these will help me cut down on my *duh* gardening factor. This composter is one I'm interested in. I won't be making a pile and turning it with a pitchfork - I can easily see myself getting lazy about that. What do you think? I've heard I might need to get 2 if we really get into composting this year. We'll start with 1 and see how it goes. And our bean challenge...I've fallen woefully behind. We have missed 3 weeks of bean dinners - our family's schedules have changed recently and my cooking habits have changed along with it. Or more accurately, I have not been cooking on a regular basis. What happened to my inspiration and motivation? Any cooks out there who struggle with occasional boredom? How do you reinspire yourself? I'm a lazy composter with just open contained piles. At some random point each year, I start adding to the OTHER pile and let the first rest, then use it up, then switch back to adding to it and let the other cook a while. Sometimes I turn them a bit. Sometimes I rototill them, which is great. re: weeds, my lazy composting means I deal with more of them after I first lay out fresh compost, but then they go away. Re: cooking inspiration. I have to cook new recipes or I get totally bored. This is affordable with the Internet but I do also buy new cookbooks periodically then concentrate on one for a while it seems. On that composter: All I can say is, I once had a neighbor who had one of those on the side of their house. I had the joy of looking at it from the window all the time. I never saw those neat, tidy drawers all stacked away nicely. Instead it was bulging with doors that wouldn't shut, stuff sticking out all over the place. Goop draped over the top. Basically it looked like the pile-style of compost with a bin thrown in for good measure. But that neighbor was a total idiot, so I'm sure they did something wrong. My guess is not much material fits in unless you whittle it down to size. Good luck with it!! Oh, I have cooking boredom all the time! It's this daily task that has to be done over and over, often with little thanks or appreciation. When I end up in a rut, sometimes a new cookbook or recipe will help. Sometimes all I need is a break. We'll have a few 'lazy' meals that require little prep and effort. Some favorites are bean and cheese quesadillas or a quick lentil and rice dish with seasonings. Another favorite is taking some bread, sprinkling chopped frozen (and thawed) broccoli on top and then adding a slice of chedder cheese. I broil them in the oven until the cheese is all melty. Then we serve them with a side of carrot sticks or apple slices. But a break is often just what I need to get up and start cooking again! 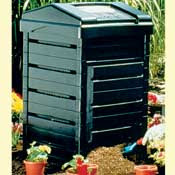 I have a large compost bin sort of like the one you have here, except it is a three drum structure. It works great. Easy to maintain, doesn't stink and gives great compost. It was pricey, but the results have been worth it. If you hate weeding then try sticking to straight box gardening or for the best results build your own earthboxes and really focus your efforts - although they really take the fun out of the whole thing. As far as the cooking is concerned, we usually will take our stock recipes we know by heart and mess with them. Switch up something simple like replacing brown sugar with molasses and fructose or using soy flour instead of eggs, etc. This way you can experiment with getting new tastes out of the same meal while also toying around with the ingredients to see how far you can push them. Maintaining a compost heap is actually really easy - and if you don't see yourself turning it, no worries. It just takes longer, i.e. 3 months vs. 1 month in the Midwestern summer. The results are worth it. I made an almost free bin by repurposing wood pallets and staking them into the ground to create a three-sided "stall." Position it under a corner of your garage that gets a lot of rain runoff, and you shouldn't need to hose it down much. To stem boredom, I frequently check out cookbooks from the library and read them like novels. Another idea, host a vegan/vegetarian/earth-friendly/locavore potluck, and have everyone bring copies of their recipes to share. Or, invite friends over so you can all prepare a fun veg meal together. I am going to venture into gardening this year and I have a friend who's helping. Thanks for the tips :D About the composter, he has a round one that all you have to do is spin it once a day. It looks very easy to use and doesn't smell bad at all. I have two...one is tall, like the one you have pictured. The other one is a drum-shape and is wider. I like having two. And I like the drum-shaped one best because I can just lift it up to move it (the cooking compost stays where it was) and then I shovel the cooking compost back into the new location of the drum. My drum composter is the 'end stage' composter. it's just easier to remove the finished compost from this one. By the way, my drum composter is a hand-me-down....doesn't get any greener than that, does it? And the cooking.....oh the cooking. I go through the same stages you do. I have no solution for it. Let me know if you find one. I think we all just need our own wife sometimes. I know I do!